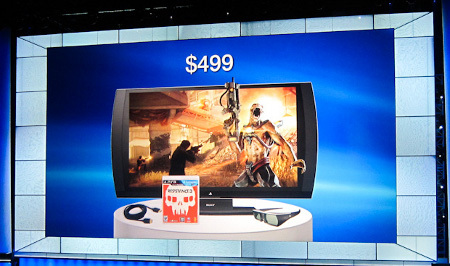 Sony has taken advantage of E3 2011 to announce that they will be rolling out a spanking new 24″ 3D Display for the masses later this fall, where it will arrive in the Land of the Rising Sun, North America, Europe/PAL territories, and Asian countries/regions. Wait a minute – doesn’t that mean the whole world? Perhaps, save for Africa. Well, our friends living in North America will be pleased to know that the Sony 3D Display will be accompanied by its own pair of 3D Glasses to help you get started right out of the box, in addition to an HDMI cable and one of the most anticipated titles on the PS3 platform – Resistance 3 from Insomniac Games. Retailing for $499.99, it would prove to be an interesting experience and perhaps a hard sell, considering how the economy does not look as though it would change its outlook anytime soon, even when Christmas time rolls around. Just in case you were wondering, you can also purchase the 3D Glasses separately if you do not want to pick up this bundle, where it will retail for $69.99 Stateside. This new product will offer gamers easy access to all of their 3D entertainment in a step as simple as connecting the PS3 to the 3D Display. The 3D Display itself will feature a 24″ full HD LCD display which is an industry first for its size – according to Sony, where the display adopts quad-speed frame sequential display technology which is capable of minimizing crosstalk distortion for stunningly realistic 3D viewing experiences. The 3D Display will also boast of support for a bunch of 3D formats, where among them include “frame packing,” “top and bottom” and “side by side,” letting users experience different options when it comes to 3D enjoyment.